Every couple wants their wedding day to be special, hopefully something that’s a little different than weddings of all their friends. 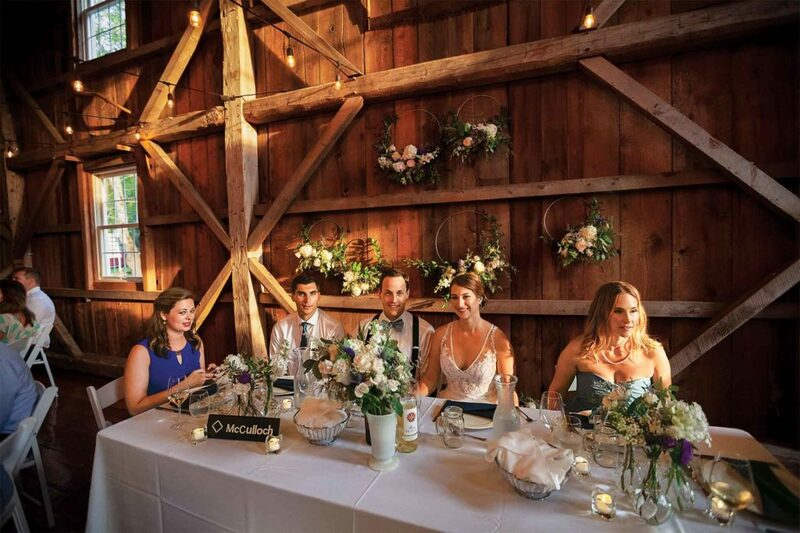 That’s why country barn weddings are becoming a big business in Canada and the United States. There’s just something romantic about holding your wedding in a majestic 19th century barn built with hand-hewn beams. They’re solid, sturdy, and have stood the test of time—just like couples hope their marriage will. The Grange Manson barn in Austin, Quebec, kept catching Jodi Clark’s and Tyler Hunt’s attention every time they drove by it on their way to visit family at their cottage on Lake Memphremagog. Tyler had been seeing the barn for much of his life. His family often drove by it at its original location, near Knowlton’s Landing, when they went skiing at Owl’s Head near the Quebec/Vermont border. Even though they had only seen the exterior, the outdoorsy Montreal couple was captivated by its beauty. They also noticed that a lot of weddings were being held there. Manson lovingly spent nine months of his spare time on weekends, nights, and holidays taking the structure apart and moving it to its new home on land he had bought in Austin, Quebec. It was a giant jigsaw puzzle. Floorboards were in one pile, roof boards in another and the wall boards in yet another, Manson says. Each piece was numbered when they took it apart so they’d know how to put it back together again. Only a few of the frames were kept intact during the move. 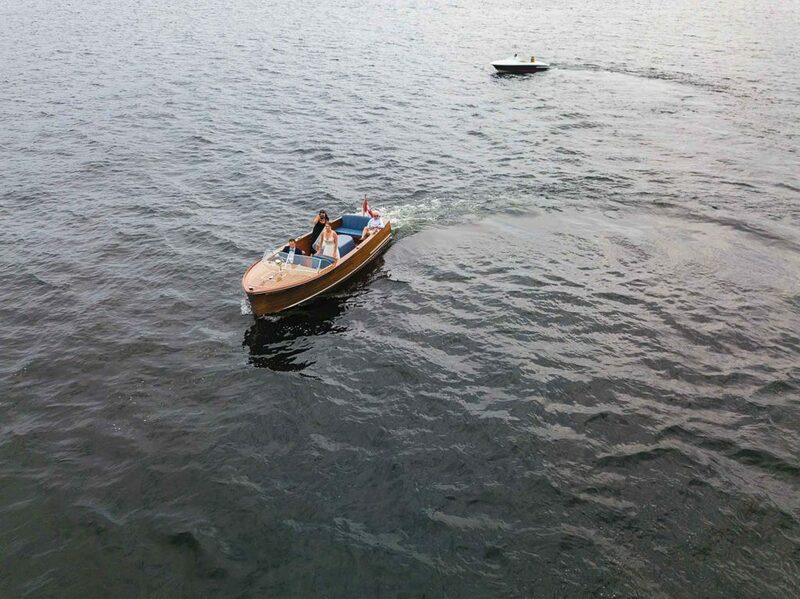 The couple’s story began when they met at a sailing school just down the road as teenagers so they did their first look photos in Tyler’s father’s antique Chris-Craft boat . It took a couple months of their spare time just to make the shingles using an antique mill that was powered by a flat belt off an old tractor. It was the last time the mill was used; it was sold shortly after they had finished. He was able to purchase the 16-inch blocks of cedar he needed to make the shingles from a friend who happened to be harvesting a big stand of cedar. Looking back, Manson could hardly believe how lucky his timing was. Attracted attention. The property where Manson had relocated the barn to is at a major intersection on the road to the Abbaye de Saint-Benoît-du-Lac, a major tourist attraction in the region. People noticed it right away. Strangers started stopping in and asking him about renting it for a wedding or for Octoberfest before he had finished reconstructing it. After a bit of research, he quickly realized barn-themed weddings were very popular in the United States. 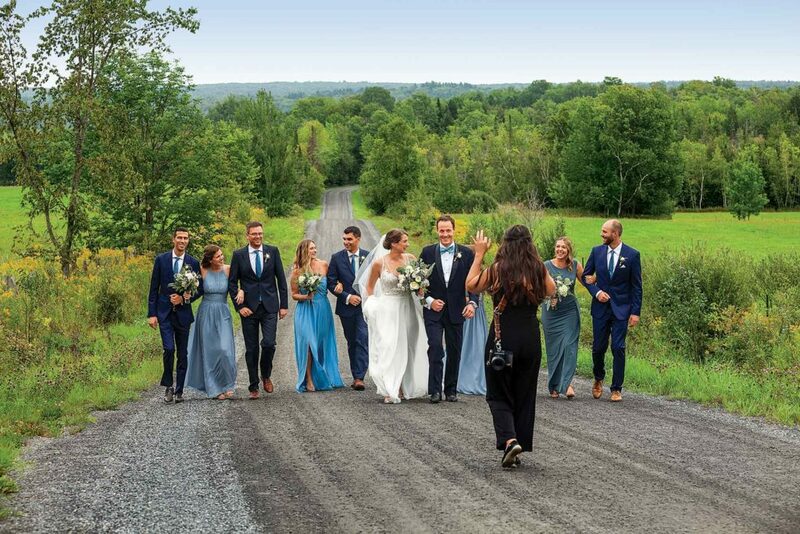 Manson found some beautiful barn wedding venues in Vermont, New York, and Pennsylvania but found no others quite like his that were available in Quebec. It’s quickly become a popular spot in the summer wedding season; they host between 20 to 25 weddings each year. Weekend bookings typically will fill up a year in advance and sometimes two. The Grange Manson barn, a huge three-story structure, is impressive. The lower level features a walk-out basement that contains an area where the bridal party can get dressed, a honeymoon suite, and a separate games area where the groomsmen can relax before the wedding. Most couples choose to have their ceremony outdoors on the grounds, either by the pond or in the backyard among the trees as long as the weather cooperates. The barn’s upper loft is held as a backup site in case of rain. The barn is mainly used for the celebrations afterwards; the main floor and the upper loft area will easily seat over 200 guests. 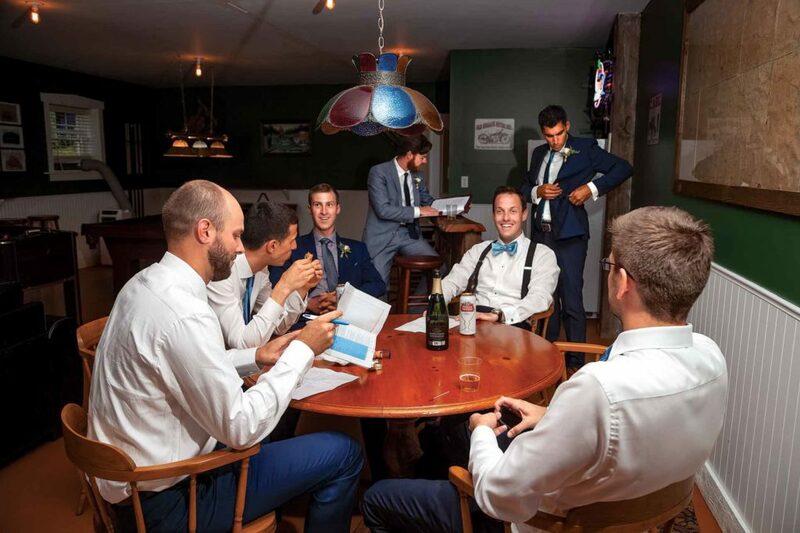 Tyler Hunt and his groomsmen spend time relaxing in the Grange Manson Barn’s game room before the ceremony. A love story. Jodi and Tyler had a strong attraction to the barn. Their love story began at a sailing school in Sargent’s Bay on Lake Memphremagog just down the road when they were teenagers. Their grandparents had cottages right next to each other. The couple even had a ski theme at their wedding. All the guest tables were named after runs at either Mont Tremblant or Owl’s Head, and there was a huge 3-by-6-foot sign board that let people know where they were sitting and showed ski maps from the actual mountains. The beauty of Quebec’s Eastern Townships provides many great photo backgrounds. Manson says he finds that most of the couples he rents to are great to work with. He quickly learned that he could rarely count on getting much sleep on Saturday nights because he has to be at the barn for closing time at 2 a.m. to make sure the music stops on time and to help deal with any problems. It’s often 3:00 a.m. before the last guest leaves and the DJ or band gets packed up. After that there are a few hours of cleaning to get ready for the next wedding party coming on Sunday. Local accommodations are very limited near the barn so excessive alcohol consumption can create problems. Manson will urge the bridal couple not to have an open bar. He strongly recommends that they have buses available to bring their guests to and from their hotels in Magog or Owl’s Head. This reduces the temptation for guests to drive after the wedding if they’ve been drinking. While some of his neighbors were initially wary about Manson moving his barn into the small mountain village, it turned into a real economic driver for the region. He provides all his clients with a list of local suppliers that can provide everything from flowers to DJs. It includes local caterers who can provide everything from the traditional Quebecois Mechoui-style barbecue buffet to a full five course meals. The nearby inns fill up and many locals rent out their homes to wedding guests through AirBnB. Tyler and Jodi wanted their wedding to provide guests with an opportunity to get away from the hustle and bustle of city life. Jodi and Tyler discovered that holding their wedding in a rural setting that’s a two-hour drive from where they lived has its own set of challenges. To make matters worse, the new owners of Owl’s Head had closed the resort for renovations. So they reserved a mixture of Airbnbs, B&Bs, cottages for rent, hotels, and condos for their guests who weren’t locals as far away as Magog and then booked shuttles to get them to and from the venue. The weather forecast was ominous for the day of the wedding. Guests coming from Montreal drove through pouring rain two thirds of the way. But luck was with them—the heavy rain stopped just before the exit for the Grange Manson Barn.